Under-inflated tires are a disaster waiting to happen. If your vehicle has uneven tire pressure, you are at a greater risk of a blowout. When that happens, it affects everyone on the roadway until you can steer the vehicle to a safe zone. If you happen to be on a multi-lane roadway, having a tire emergency of this capacity can easily cause an accident. Then you’ll be facing even more damage than a shredded tire. The auto manufacturing industry has made great strides in vehicle technology. One example is the creation of tire pressure monitoring systems – TPMS for short. These have been installed in all vehicles that were manufactured after September 2007. They are designed to alert you if your tires are underinflated. The alert is not triggered until the tire comes in below 20 percent of the factory recommendation. It’s imperative that you still check your tire pressure often. If you have a heavy commute, this frequency would be either weekly or every other time you fill up. For those with lighter driving habits, this could be as little as every month. Since TPMS is still fairly new, many who visit Kelly Clark Automotive Specialists in Phoenix, AZ have questions about the system. Even if you’re not thinking of it, it’s good to have the knowledge of what the practical value TPMS provides. It can alert you when your tire is losing pressure due to a puncture or a bent rim. That’s an important warning to have that you might not have noticed until the next time you gassed up. We are all prone to forgetting tire pressure checks. The TPMS alerts is a fail-proof system to let you know when there’s a problem brewing with your vehicle’s tire performance. There are other signals that can cause the TPMS to go off. The system monitors itself with sensors that are mounted in the wheels. These sensors have little batteries that send a signal to the driver’s dashboard monitor. As the batteries die from time or exposure to high heat, the TPMS will let you know. Another common problem is that the sensors could break in the Arizona heat, leaving you in need of a TPMS sensor replacement. For those who visit areas where road salt is needed, it can also ruin the system, requiring you to need more frequent service for your tire pressure monitoring system at our Phoenix-area auto repair shop. Did you know the TPMS needs to be recalibrated from time to time? The TPMS will need to be recalibrated every time you have your tires rotated. The same necessity is true for when you have a flat repair or new tires installed. Recalibration keeps the system informed as to which tire is on which corner of the car. 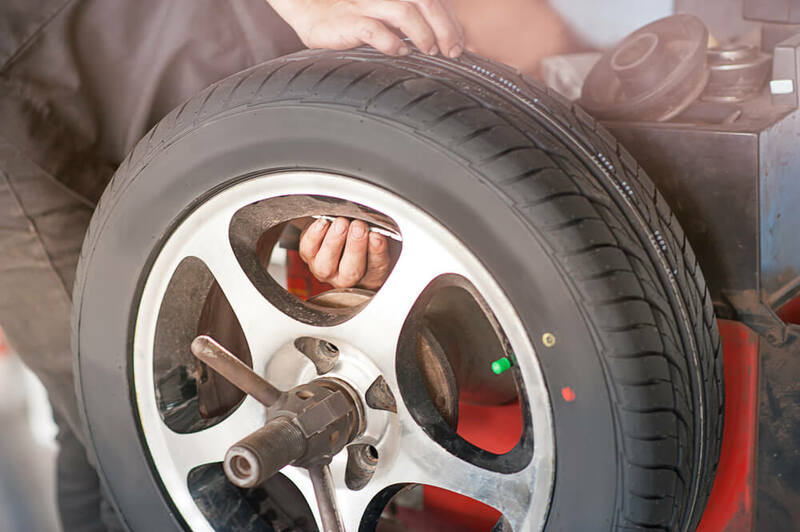 If you decide to add custom wheels to your vehicle, you may even need to install all new TPMS sensors if the originals do not work on the new rims. Otherwise, your TPMS light will be on constantly, and you will not have the benefit of the warning system. It’s recommended to only go to a tire shop that is experienced in handling TPMS to ensure you receive proper notifications for your tires. Understanding and working with these systems is new technology that requires the right equipment and training. Special tire changing equipment needs to be used with some sensors. This becomes even more complicated by the fact that there are several TPMS types of across all the manufacturer brands. The tire service professionals at Kelly Clark Automotive Specialists in Phoenix, AZ meet these needs. We are one of a few auto repair shops in the area that have the equipment and training necessary to service all types of vehicles with different systems. You may notice a higher price of some of these basic services because it’s a necessity to offset increased costs for special tools and certification.In short, the mandated TPMS saves lives. Its ability to detect the slightest change of tire pressure difference can help you avoid a potentially larger problem. Our automotive technicians believe they are worth the added hassle and expense when evaluated to the tire safety of older vehicles. For those with a vehicle that is 2007 or newer that are having TPMS malfunctions, bring it over to Kelly Clark Automotive Specialists. Our ASTM certified mechanics can check it over to make sure your system is operating properly for your safety. Schedule an appointment online today or give us a call!